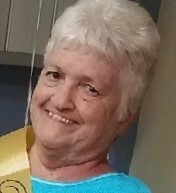 Glenna Kay Lamphier, 75 of North Judson, passed away Monday, August 20, 2018. She was born July 25, 1943 in Gary, the daughter of Robert R. and Ruby M. (Hamm) Beckett. Surviving is her daughter, Luana Douthitt (Steve) Polley, of Florida, 3 grandchildren, John R. and Laicken R. Gue both of CA, Thomas R. Polley of FL, 1great grandchild, Peyton J. Gue of FL, 2 brothers, Bobby (Marylou) Beckett and John (Diana) Beckett and sisters, Bonnie (Dennis) Peck and Mary (Robert) Woodworth and many nieces and nephews whom she loved dearly. She was preceded in death by her husbands, John H. Douthitt and Daniel A. Lamphier, her parents, daughter Johnette Douthitt and a sister Carol Sue Beckett Johnson. Visitation will be held Friday, August 24, 2018, 4- 7 PM at Bartholomew Funeral Home, 102 Monroe Valparaiso, with Funeral Services at 7:00 PM. Private Burial Services will be held at Graceland Cemetery.